Let me just say. . . I love Jen Hatmaker! Enter the book 7, and the summer of 2014. 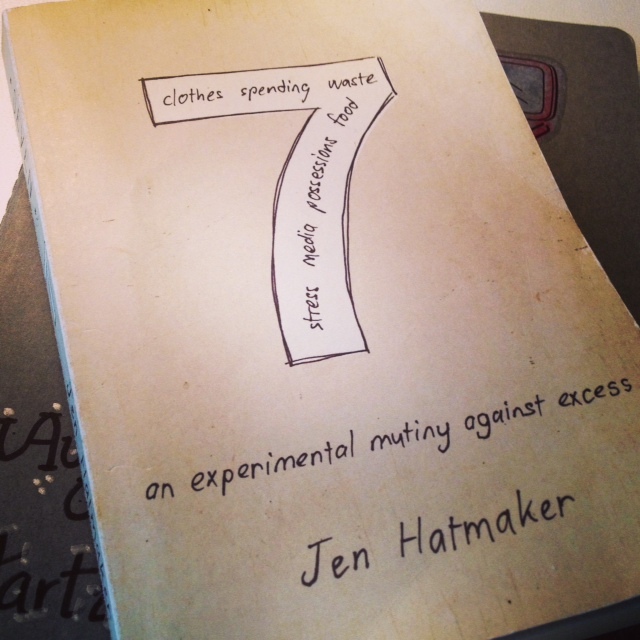 This summer I had an opportunity to join a group of women who were marching through Jen Hatmaker’s book 7: An Experimental Mutiny Against Excess arm in arm. A tremendous sense of community grew within this book group of Jesus chicks. Much like Jen’s council, this amazing group of women provided a wellspring of community resources, knowledge, support and love. But more importantly, I am different because of this group of women with whom I shared the experience. We fleshed out our own mutiny against excess. Our group discussions were brutally honest. Laughter and tears were involved…Don’t forget, this is a group of gals, and we have an overabundance of both. It was personal for me. For the past 7 months, my sweet Bear and I have been in the process of downsizing and simplifying our lives. This book was timely. During this season, I have found myself searching for and following blogs of people who seek to live a simpler, less cluttered existence… people who consider themselves minimalists…people who desire to fill moments with life…and not stuff. Books like Tsh Oxenreider‘s Notes from a Blue Bike: The Art of Living Intentionally in a Chaotic World and Hatmaker’s 7: An Experimental Mutiny Against Excess , validated my growing desire for simplicity and the reduction of my stuff. As a result, I have realized that there is a growing population of people who are seeking to live a profoundly reduced life. In 7, Hatmaker and her council of wise, like-minded friends tackled issues and areas of excess in their lives in an attempt to simplify and reconnect. Reconnect? Yes…A cleaner, greener, more organic, less consumer-driven way of life. The greatest thing about this book is Hatmaker’s unapologetic desire to love like Jesus. She grounded everything in Scripture and continuously pointed readers to grace and servanthood. There were some weeks I was raw after my assigned reading, only to go to book group and find others equally exposed and tender. This book and group of women marked my summer…and I am profoundly grateful. You are one of the precious gifts of my summer season, one that has been equally challenging and beautiful. I’m so glad you came…and are staying.